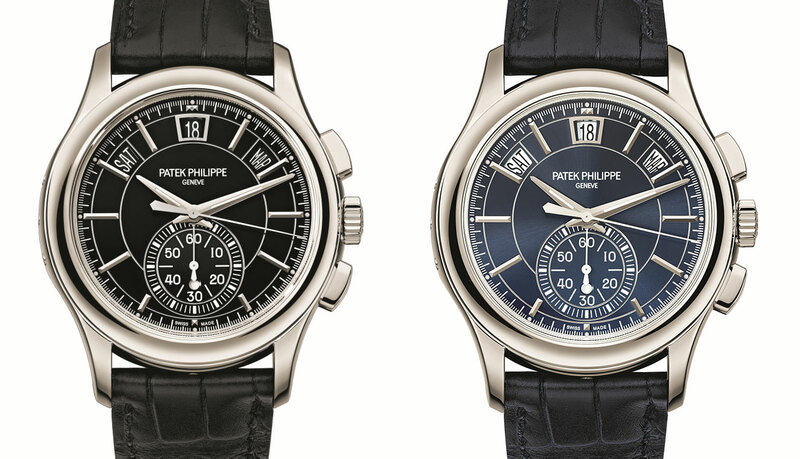 Patek Philippe introduced the second generation of its chronograph with annual calendar at Baselworld 2015, christening it the Ref. 5905P. 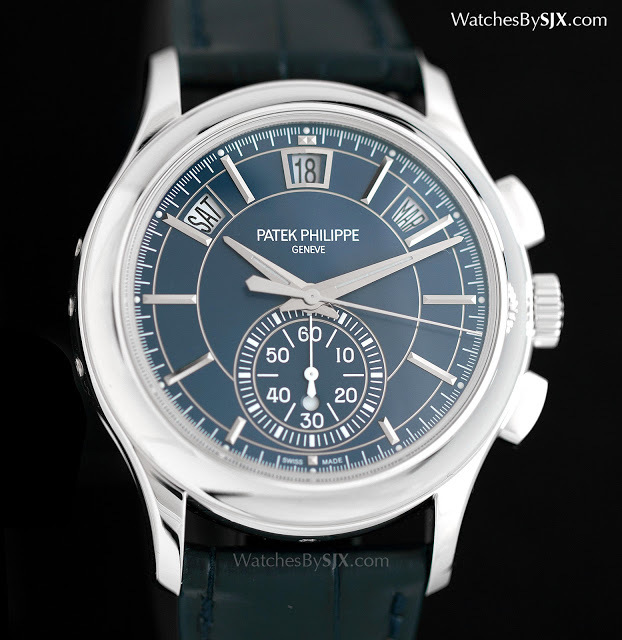 Arguably the most practical complicated watch from Patek Philippe, the chronograph with annual calendar entered the catalogue in 2006 as the Ref. 5960. That has evolved into the new Ref. 5905P that is similar to its predecessor but still substantially different. The 5905P is very much like the watch it replaces, with some minor tweaks that together give it a much more modern feel. The most obvious change is the dial design, which retains the same layout but is now styled like the other calendar watches in the collection with baton indices and a two-sector dial (the Ref. 5207 Grand Complication is another example). Classic dauphine hands are used, but with a modern twist. Instead of straight edges ending in a point, the 5905P hands are arrow-shaped at both ends. A minor detail but it immediately lends the watch more contemporary feel. At 42mm in diameter, the 5905P is larger than the 40.5mm first generation watch. That extra diameter is well hidden, with a wider bezel, case band and minute track, keeping the well proportioned dimensions of the original. The 5905P also features oblong chronograph buttons, instead of the pump-style pushers of the 5960, again contributing to the modern aesthetic. 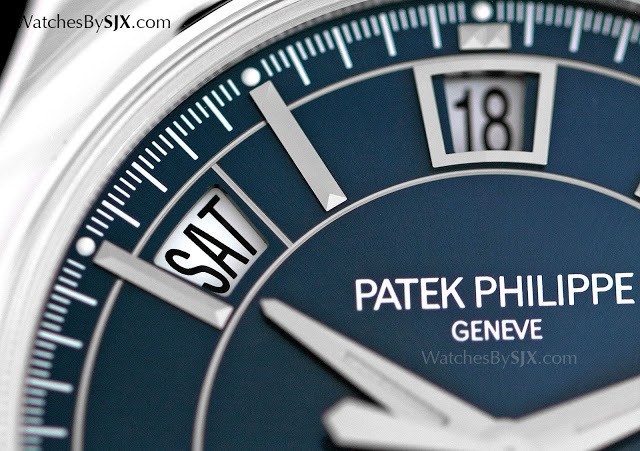 The lugs are subtle concave on their flanks (absent on the 5960), as is the bezel, an attractive detail that demonstrates the improvement in the complexity of Patek Philippe cases. Functionally the 5905P is the same, except for one major feature: the chronograph has only a 60 minute counter, instead of the co-axial 60 minute and 12 hour registers of the 5960. In practical terms it means little for most users, since chronographs are rarely used to time such long periods. 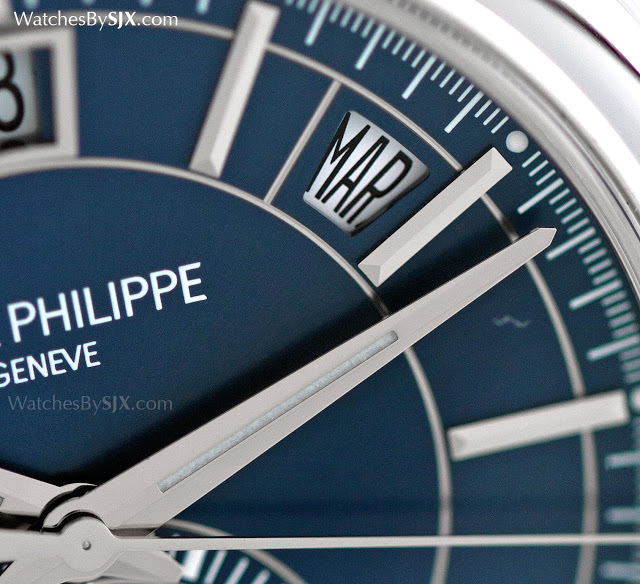 The movement inside is almost exactly the same, with the sapphire back affording the same view as in the 5960. 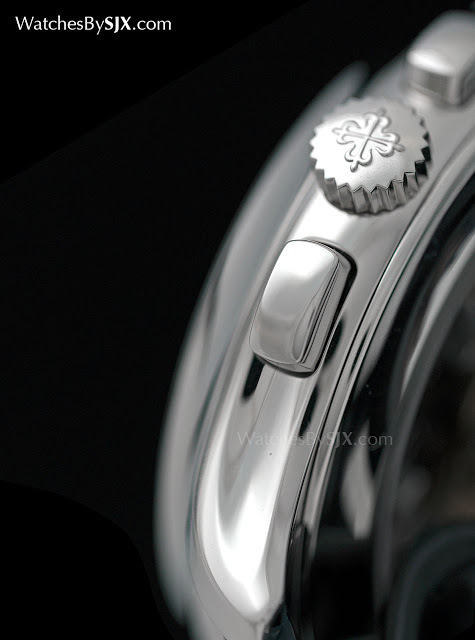 Interestingly the case back is a snap back, instead of a screw back that is typical on larger watches. The Ref. 5960 has been discontinued in precious metals, but is still available only in steel as the 5960/1A. The Ref. 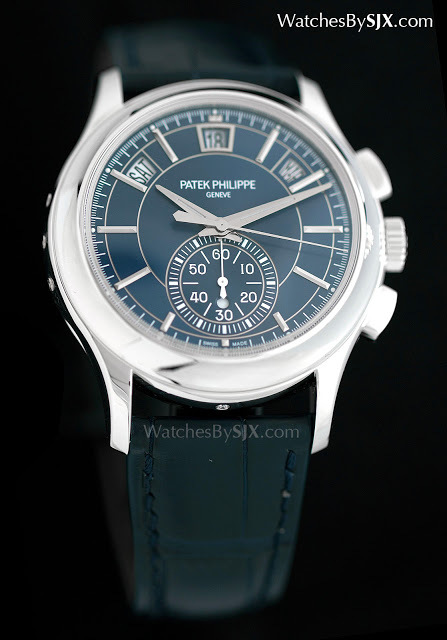 5905P is available only in platinum for now, with either a black or blue dial. The Ref. 5905P costs almost the same as the model it replaces, with retail price of US$78,200 or S$100,400.